In the raiment still wet from the painter’s brush, with one of the merriest of musical comedies on one side of the footlights and an altogether enthusiastic first night audience on the other, the new Cort theater, Dearborn street, near Randolph, made its bow to the playgoing public of Chicago last night. Both play and playhouse scored successes, and by the time the lines are thoroughly memorized in one, green enamel and ivory calcimine will have dried on the other, and the combination promises to be a popular attraction for nights to come. As far as modern conditions permit every detail of the Greek theater is said to be produced. Majestic fluted columns with Corinthian capitals flank a richly wrought proscenium arch. Above is a group of herculean figures taken from old mythology and representing Drama, Music, and Song. The boxes on the sides are arranged in an unusual stair step fashion, the box behind being two feet above the one in front. The rows of boxes lead to the balconies, which are high above the orchestra and of cantilever construction, obviating pillars and posts. Tucked away under the first balcony is a mezzanine floor with loges. 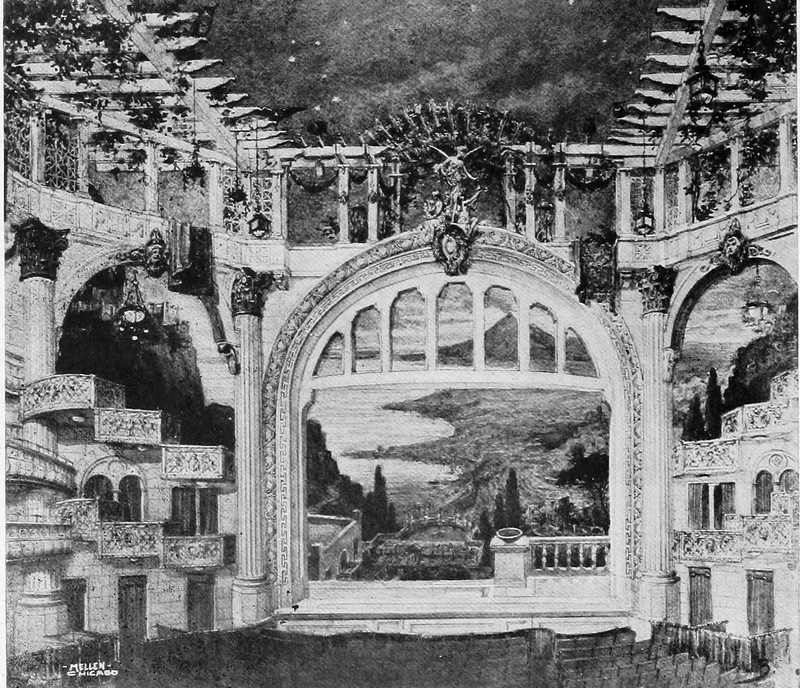 Above everything is a Roman pergola of vine clad beams and lattice, said to have been identified features in the old Taormina theater which served Architect J. E. C. Pridmore as a model for the Chicago playhouse. Showing mural painting on steel curtain. The ground space which stands the Cort theater makes radical departures in the construction necessary. In the orchestra there are only fourteen rows of seats between the footlights and the lobby. But the auditorium is broad. Each seat is within easy range of the stage and balconies and mezzanine floor seem to crows almost too close to it. The prevailing color tints are ivory and green, This is broken occasionally by gold emblazoned banners. Green coloring on the seats—which are wide, and not close together—was not dry last night, neither had enamel on radiators and walls hardened, and for the distress which was occasioned dozens of women patrons thereby no excuse seems possible. The new playhouse began its career in fortunate fashion with a comedy with music which is likely to achieve immediate popularity. 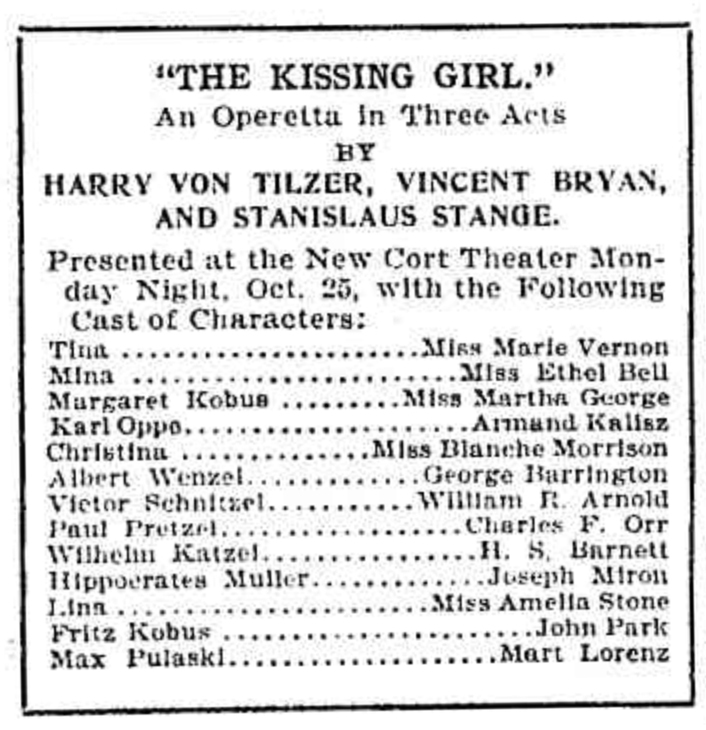 About the production—taking the new operetta and the cast together—several features impressed vividly. There is an abundance of good music. The ensemble numbers are particularly attractive and four or five songs established themselves as hits at a single performance. 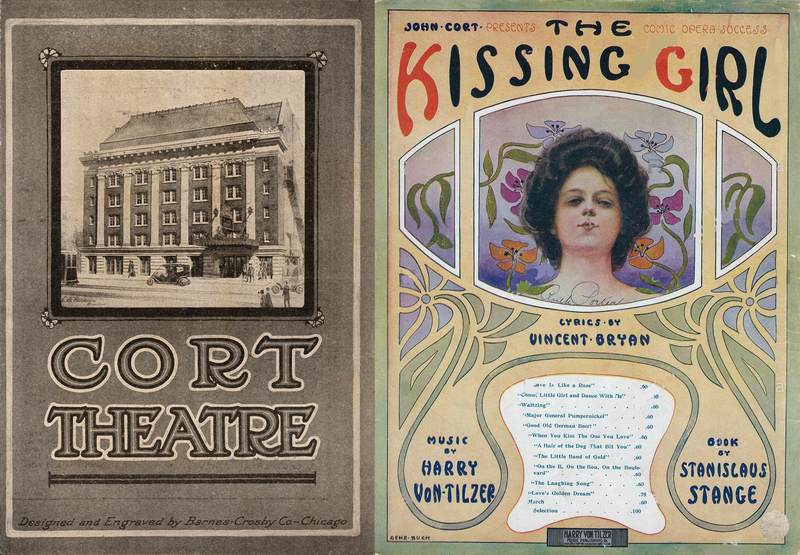 Few of the lighter musical affairs offered Chicago during several seasons have abounded in such altogether good lyrics, while the book of the operetta is brimful of amusing dialogue and clever situations. Expense seems not to have been spared in constructing three scenes in almost too brilliant riots of color, with an array of costuming not in the least bedimmed by the colorful background. 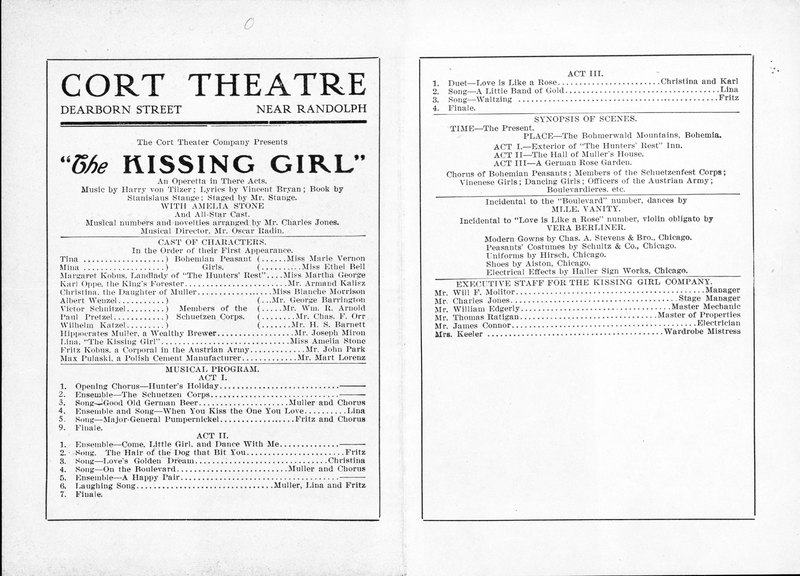 Amelia Stone is billed as the star of “The Kissing Girl,” and were it not for that, it might be suspected the piece were constructed bodily for John Park. A crowd of chorus girls, comedians, and stars of lesser or greater magnitude, seems to conspire through three acts to make “Fritz” (John Park) have a good time. He appropriates it as if by right,and his infectious enjoyment spills far out over the footlights. A plot which provides a mighty interesting amount of by-play and laugh-compelling situations in the second act serves well on which to hang many exceptionally good songs. Miss Amelia Stone is a dainty, demure, little star with a voice clear and sweet, which in facile and alluring fashion trickles over one cadenza after another. But it is fortunate that she is singing in the jewel box sort of a theater which the Cort is. Her picture of Lina, the petulant, capricious maid of the Bohmerwald mountains, was refreshing and entertaining throughout. 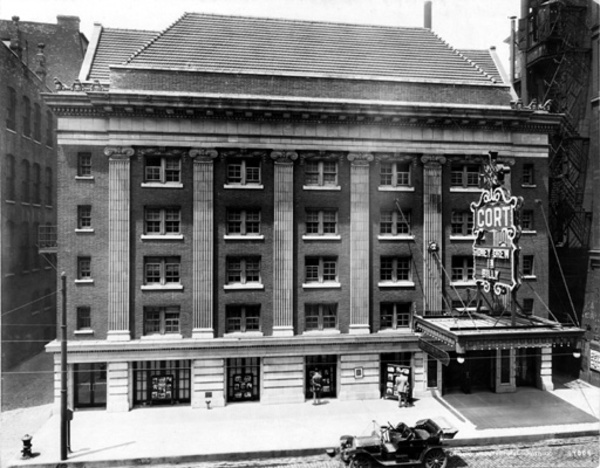 The Cort Theater building, 132 North Dearborn street, was razed in 1934 and space used for parking.